Well known and very active member Brian Drummond, otherwise known as Percy, who has recently retired after 50 years of railway service. Needless to say, he retired in some style. 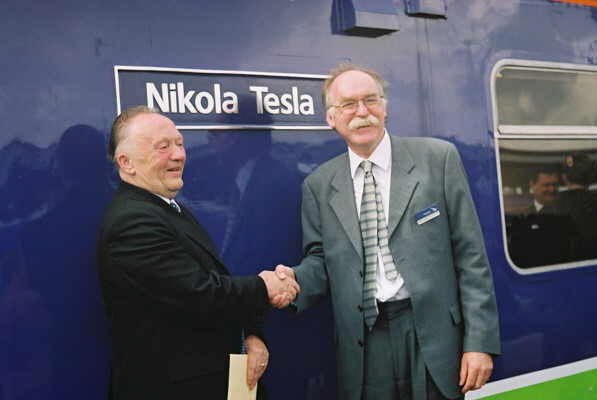 On Friday 31st August 2001, Silverlink Metro named class 313 unit (a dual voltage 25kvac/650vdc) No.313 116 Nikola Tesla at a ceremony which took place at Watford Junction station on the West Coast Main Line. 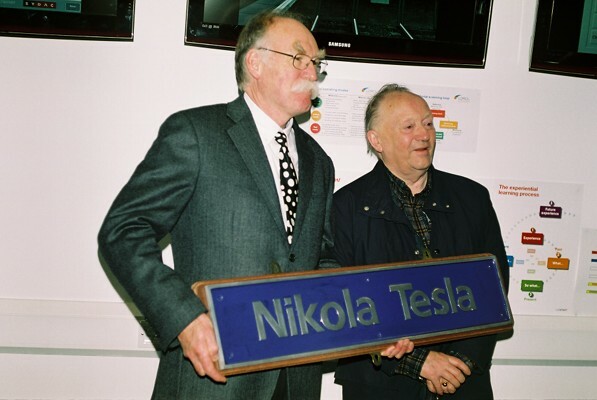 The name was chosen in recognition of Nikola Tesla's (1856/1943) achievements; a Serbian-American Inventor and researcher who discovered the rotating magnetic field, and to mark the retirement, after some 50 years footplate service, of member of staff Brian Drummond. Brian who is a member of the Locomotive and Carriage Institution, undertook the naming before working the train, which was his final driving turn, as a special to Kilburn. It was a very interesting and enjoyable occasion and thanks must go to Silverlink and Mick Boyd for making such an event possible, and to Brian for fifty years railway service. For those who may wish to find out more about the work of Nikola Tesla, a good starting point is the Nikola Tesla Museum, Belgrade, who can be found on the Internet at : http://meri.yurope.com/org/tesla/ . 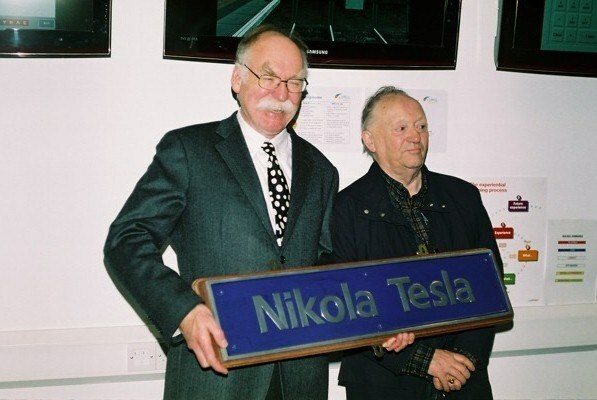 London Overground Rail Operations Ltd. are removing the name plates from their class 313 units and in the case of 313116 'Nicola Tesla', one of them was presented to L&CI member Mick Boyd (left on photo), who suggested the original ideal of the nameplate to LOROL's predecessor, Siverlink, see below. The presentation took place at Willesden TMD on Friday 25th January 2009, also attended by L&CI members Brian (Percy) Drummond (right on photo) and Roy Crocker (photographer). During early 1987 Brian told me about a book he had recently read; it told the story of Nikola Tesia's life and achievements. He told me a little about the book "Lightning in his hands" and recommended that I read it too. After I had read it we often talked about the man's genius and foresight. Around that time the East Coast line was newly electrified. We came up with the idea that naming one of the new A.C. electric locomotives after Tesla would bring his name out of obscurity, after all without his pioneering work in the field of A.C. there may not have been modern electrified railways. We went straight to the top and in May '87 put our idea to Cyril Bleasdale the then General Manager of the London Midland region. We received a reply turning down the idea citing "lack of publicity and/or customer goodwill" and that the name would be unknown to the majority of customers. We wrote again feeling that the point had been missed and curiosity would lead customers to find out more, we also added that the names of some of the then named locomotives were unknown to a lot of people. To solicit more help we even visited the Yugoslavian Embassy in London, neither of us had the courage to knock on the door, we needn't have worried ... we had been observed from within and a rather forbidding guard opened the door and asked what we were doing! After explaining our quest we were ushered in to an anteroom while some one was summoned to speak to us. We explained what we were trying to do and we were told they would help us if they could. Correspondence continued to flow, we were by now writing to the British Rail Staff Suggestion scheme but we still got turned down. It was now June '89 and we realised that our dream was not to be. Over the intervening years we often spoke about resurrecting the idea but we never got round to it. Move forward to Spring '01 and thoughts of Brian's retirement later in the year. 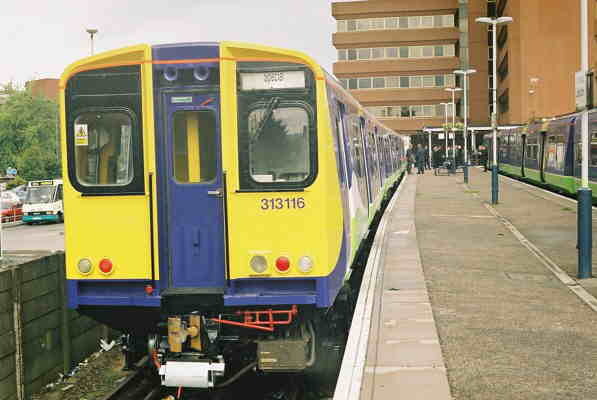 The naming of a class 313 train to recognise his achievement was put forward but what to name it? "Percy" or Brian Drummond" was mentioned. I knew straight away what Brian would like to see ... it has taken around 13 years but I am sure he will be pleased.